10:30 AM “Avez-vous un parapluie supplementaire, s’il vous plait?” (“Do you have an extra umbrella, please?”) I asked the man at the desk. “Oui.” “Ah, très bon.” Now I have this great umbrella – large diameter, hooked handle, no ugly hotel insignia – and I am out of my room. I quickly determined that I would NOT be spending hours in line at the Louvre in the rain, promising myself that tomorrow, for sure, I will go. Today, I realized may just be the perfect meandering and cafe day. Perhaps I’ll make my way to the 5th and 6th Arrondissements. 12:50pm Finalmente. The Left Bank. 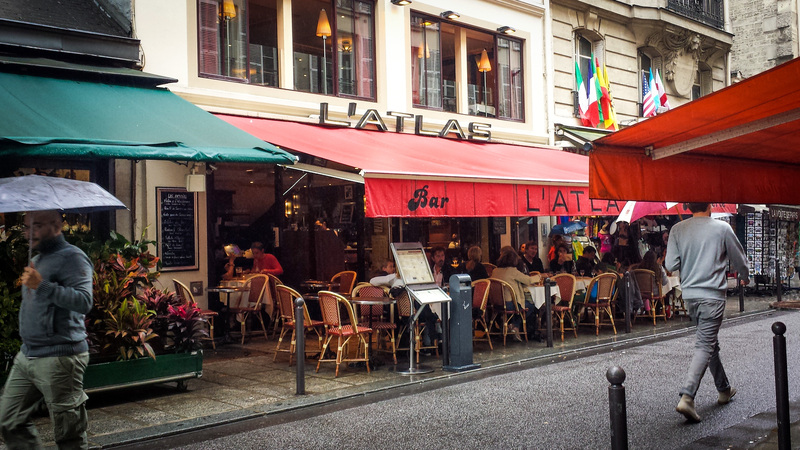 L’Atlas Brasserie. Un verre du vin rouge. (A glass of red wine.) I walked forever in the rain. I crossed the Pont des Beaux Artes and la pluie pummeled me. But, still those locks of love stop me in my tracks everytime. My black flats were soaked through to the point I worried I might slip and fall. (Oh, right. Did I mention I forgot proper shoes, too?) Never before in my life have I wanted a roll of paper towels or some newspaper as badly as I do now, to stuff in my shoes. 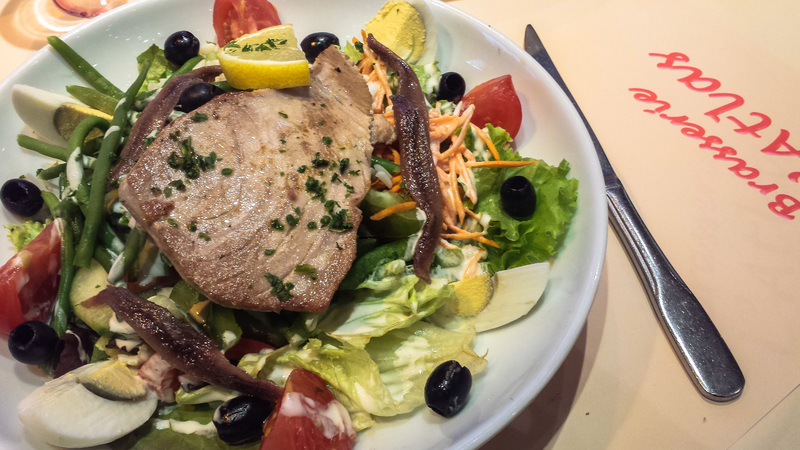 I’ve ordered the plat du jour: foie gras de canard sur toast, une salade nicoise, et un verre du vin rouge (pate of duck liver on toast, a nicoise salad, and a glass of red wine). 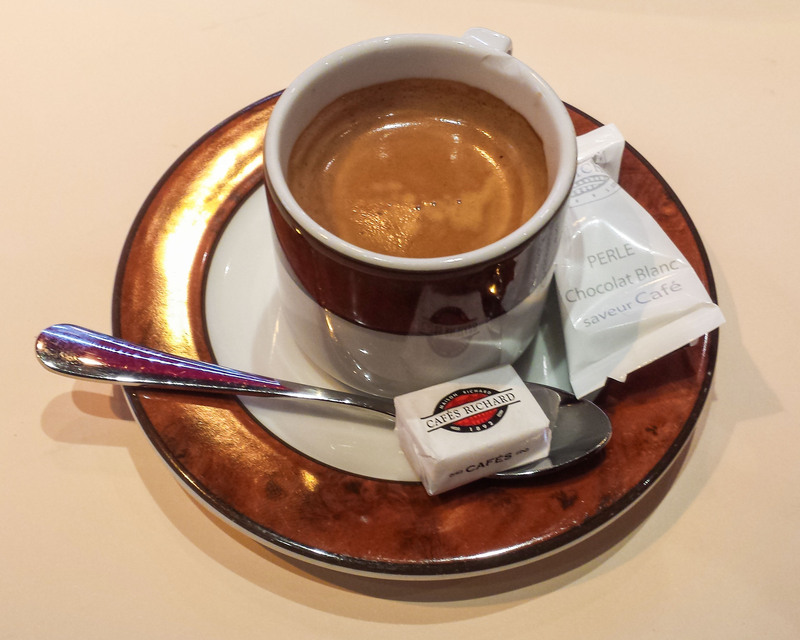 They have café express €2.50. Good. “La Maison N’Accepte Plus Les Cheques” That’s okay. I didn’t bring any checks with me. I am frustrated, as ever, by my lack of knowledge of the French language when speaking and when spoken to. 1:05PM The foie gras is quite nice. I’m trying to relax but I have such a hard time in close proximity to others. I feel shy and uncomfortable. I’m consciously trying not to furrow my brow. 1:15PM I just caught myself unintentionally moaning as I took a bite of foie gras! 1:25PM I am surrounded by native French speakers and I am tired and not a little intimidated. If I learn and remember nothing else this trip, I shall learn and know the Quick Reference essentials in the front of my Berlitz French Phrasebook. (Many of these I’ve learned and lost due to not practicing…) I should also learn the eating out part. Again. Pour emporter – to take away (although I don’t recommend “taking away” – sitting and eating, especially in Paris, is so much more desirable). I just realized that a brasserie in which I am surrounded by native French speakers instead of English speakers is a good thing! If the locals like the place, well then, it must be the right place for me to be. Plus, how else to practice this confounding language? It’s all in the way you look at it, I suppose. The rain continues but I am indeed in a wonderful spot. Facing the street, just inside the restaurant, although it rains it is not cold. My feet are drying a little. And, my “salade” has arrived and it is beautiful. It has white rice. Haricot vertes – it took me a moment or two to remember the name of these slender, tender young green beans. In the drab black, gray, and olive-colored wetness, a woman walks by carrying a brightly-colored bouquet of coral-red roses. At the table not a meter in front of me, a pretty blonde woman speaks to her male companion and he smokes and looks at his phone. But almost as quickly the phone is put away and he interacts with her again. She is a talker. She’s ordered un express, as will I when I finish. The other couple in front of me, marginally older, eat dessert: he has a simple crepe au sucre and she eats tarte tatin. They rarely speak. He is quite a bit older, I think. And – oops – she caught me staring. 2:10PM It is an hour later and I am still here. I love that. If I choose, I could stay here for hours. A flotilla of umbrella-laden Asian pre-teens wade by. A Spanish-speaking family: father, mother, and three daughters laugh at a table by the street. A woman – so pretty – has just arrived with a male companion and a young boy. Her beauty is a show-stopper. Her nails are cared-for and pink. He hair is up in a perfectly messy bun. Two ladies have just received their lemon pie with cream (chantilly – I love that) and perhaps ice cream with chocolate sauce. I’m flagging and ready for my espresso. I must try to sleep early tonight. I need a box to mail some things home. I over-packed again. I need a little sewing kit to sew my pretty button back on my black sweater. The young Spanish-speaking ladies (at least the two I can see) are leaving their tomatoes on their plates. They are pre-teen-appearing, too. The other girl, whose plate I cannot see, wears a green scarf around her neck. She must be about 9 years old. Body language. A couple with perhaps a 9 or 10 year-old boy eats a hamburger. The woman is closed, arms and leg crossed, little expression on her face, maybe a small smile to the man just now but still closed. The man has his arm draped across the back of her chair, looks at her often, smiles and laughs. The boy keeps up an animated conversation. I wonder. Is the affair over and he’s come back or does it continue? Is the child’s animation a compensation of sorts for the tension flowing from his parents? Across the street, the sandwich seller makes eye contact with me. I look down immediately. My forehead muscles are working hard to keep my eyes sufficiently open. I am weary. Ah, the couple just smiled and she wrapped her arm under his for a moment. Perhaps they’ve simply been long-together and have many, many more comfortably distant years to go. The little blonde boy with the gorgeous lady looks sensitive and serious and a little sad…The pretty woman bends her head towards his and tries to engage him. He remains very quiet. 2:40PM Finalmente. “L’addicion s’il vous plait.” Check please. “Merci pour votre service.” (sair-vees) Thank you for your service. Time to continue my meanderings by foot. But soon I shall return to the meanderings of my mind and pen: my café contemplations.